Travelers heading to Israel: we would like to give you a few words of advice in case you are planning a city trip in this country. If you ask us: forget about Jerusalem and Tel Aviv all together and don’t even bother to head over to Haifa or Akko. 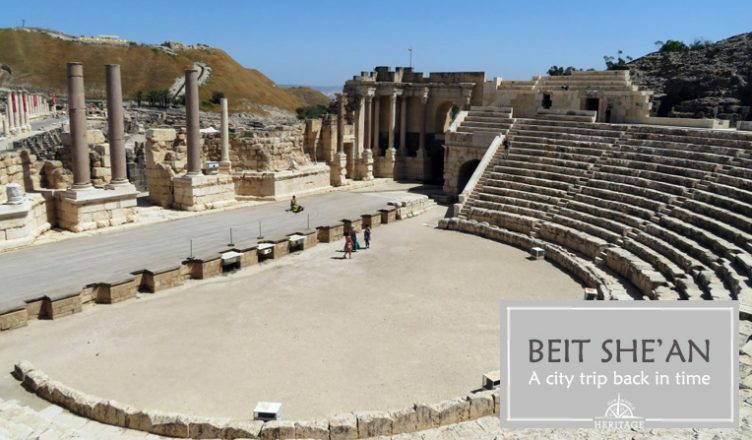 For the ultimate city trip experience in Israel we advise you to go to Beit She’an instead. In our opinion, this city appeals to any type of visitor. Shopaholics may want to check out the small boutiques on Palladius Street or the marketplace of the agora. Culture enthousiasts are recommended to visit the impressive theater. 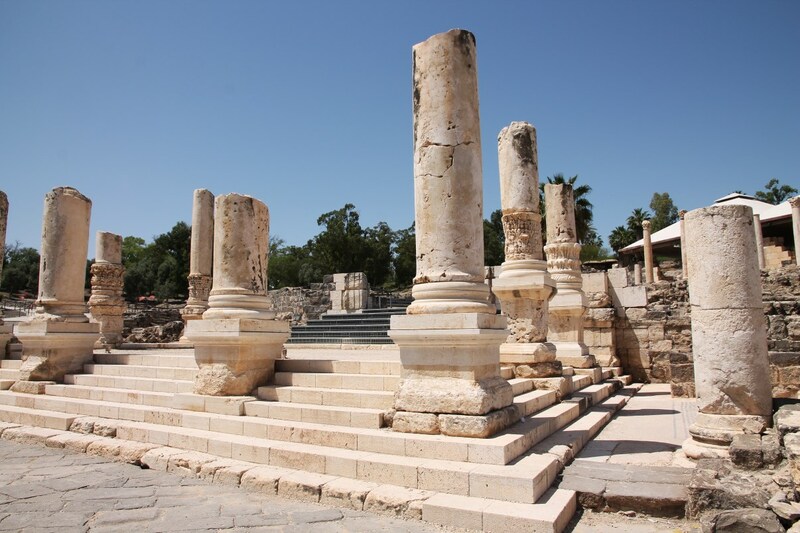 Those of you who are looking for some tranquility might find their inner peace in the Roman temple situated on the junction between Northern Street and Palladius Street, or in the sacred compound just north of the theater. 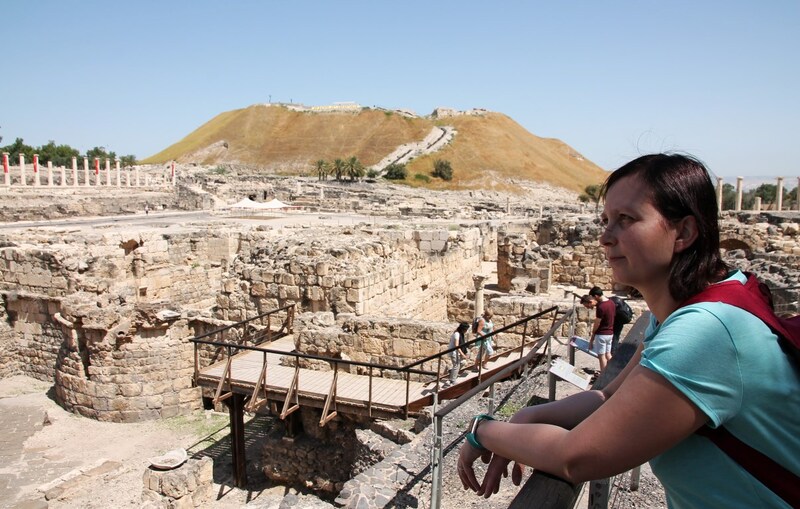 If you are here simply to enjoy the view: just go up Tel Beit She’an and gaze upon the city at your feet. It is true that during the summer months it can become quite hot inside the city, but with two bathhouses, a public fountain and even a marble-reveted pool on Silvanus Street, there seem to be more than enough options to get cooled down, don’t you think? And even though they don’t contain any water anymore, it’s the thought that counts, isn’t it? 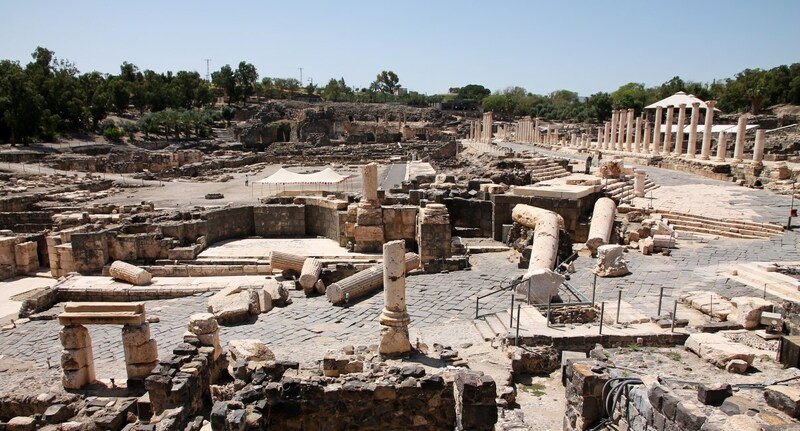 The city has been inhabitated since the 5th millennium BCE and has (more or less) survived the rule of the Egyptians, Philistines, Greeks, Hasmoneans, Romans, muslims, crusaders, Ottomans, British and finally the Israeli people. 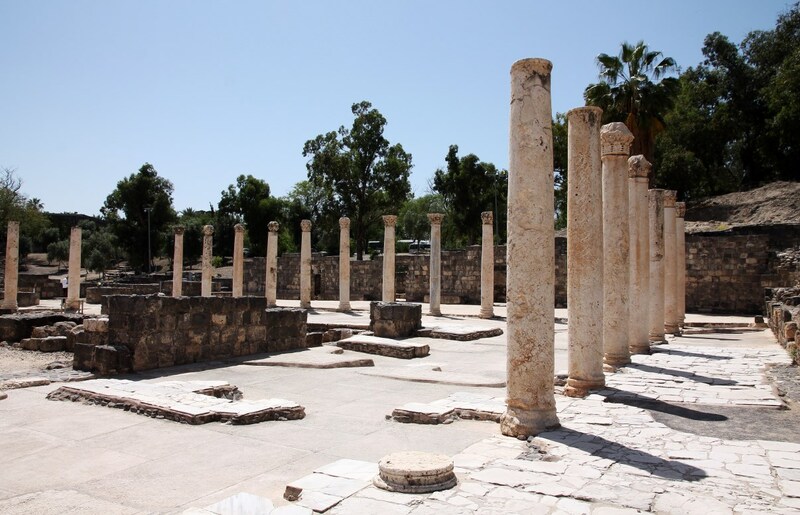 Named Scythopolis by the Greek, the city of Beit She’an has known destruction and resurrection throughout its existence. 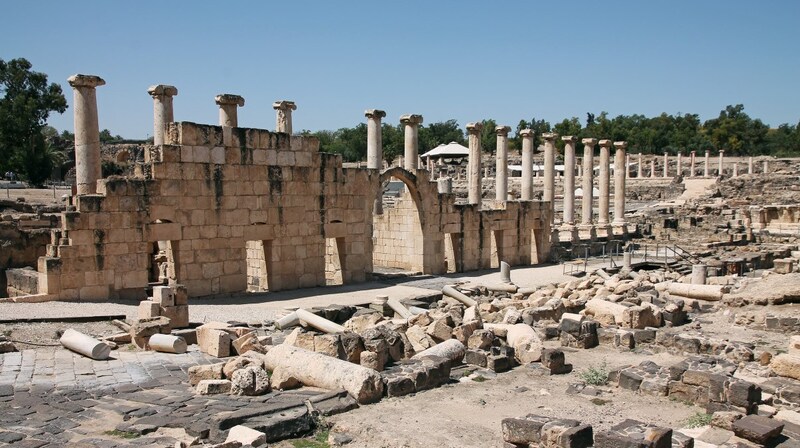 Under Roman rule, it became the most important city of northern Israel. 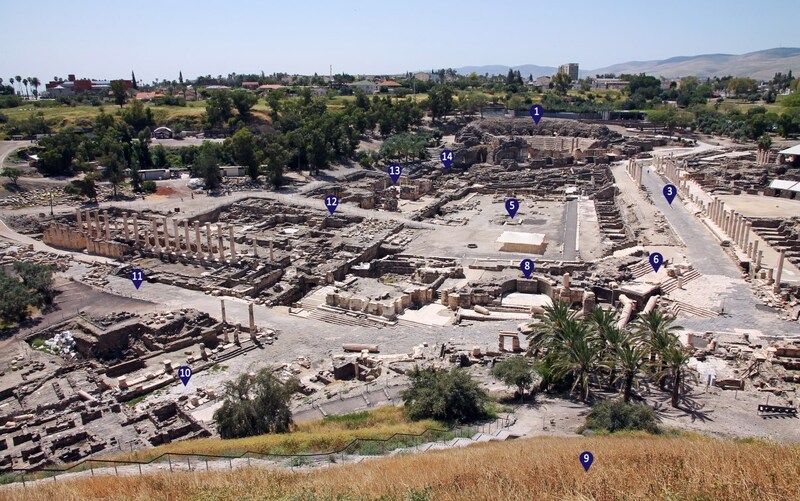 Roman Scythopolis and Byzantine Beit She’an thrived and expanded, and most of the structures that can be seen here today date back to those eras. 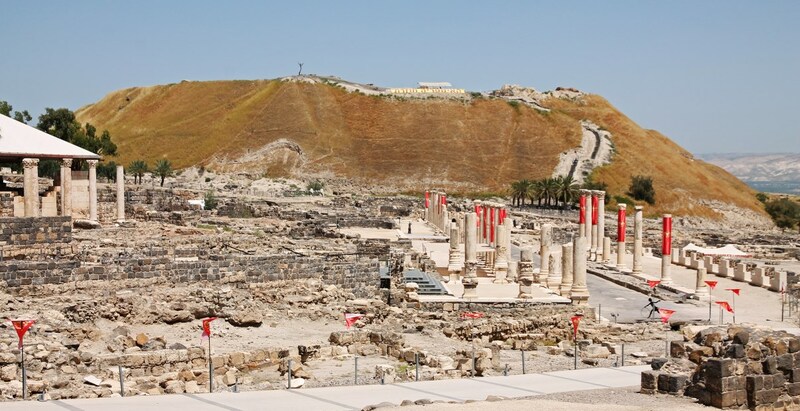 The archaeological site of Beit She’an, seen from the entrance of the NP. The large mound is called Tel Beit She’an. If you are in need of some directions (in case you are afraid to get lost in this elaborate city), we are happy to provide you with a photographic map of the city’s highlights. 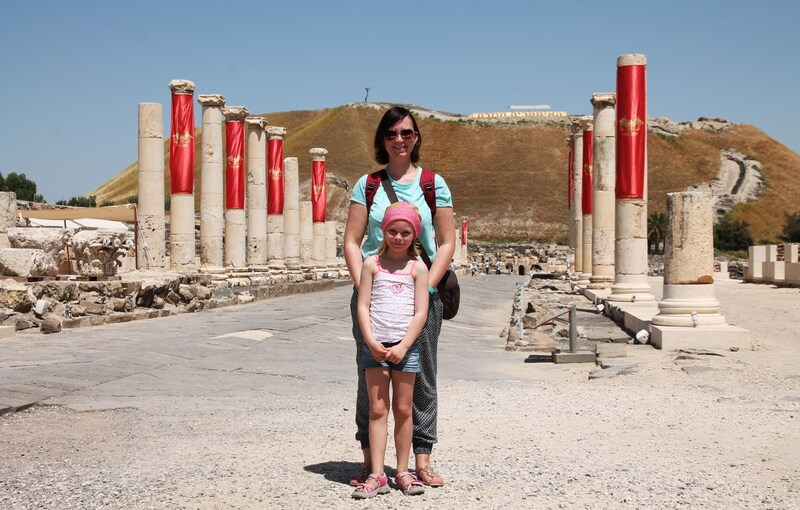 The following photos were taken from Tel Beit She’an. We have listed all places of interest and added a tiny bit of information. Good luck with that! 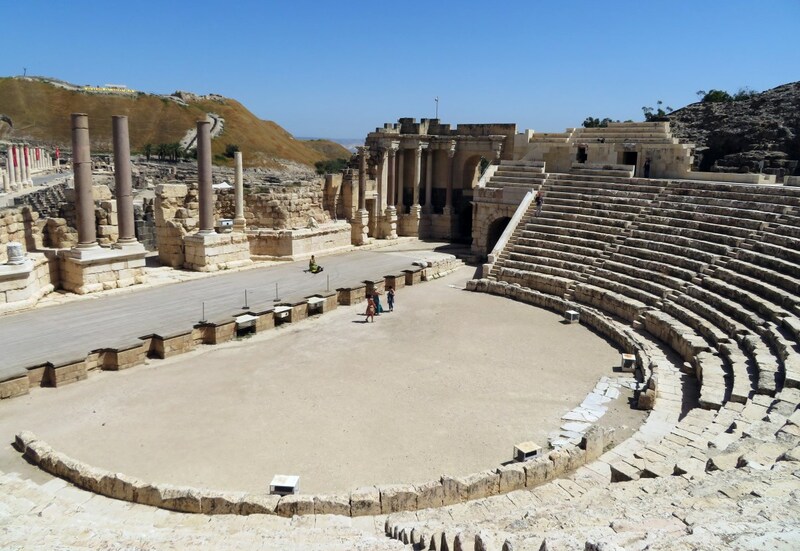 This dramatic construction was built in the first century CE, under Roman rule. Only a third of all rows of seating has survived the passing of time and the wall behind the stage has also collapsed. Nevertheless, this is by far the most spectacular building on the site. Have a seat and try to imagine the crowds watching a lively performance on stage. The largest of the two bathhouses in Beit She’an, this complex of buildings from the Byzantine period is still relatively well-preserved. Some parts of the original colonnades have been re-erected in order to give you, the visitor, an idea of the grandeur of this antique wellness center. The floor heating system (hypocaust) underneath the bathing halls is also still visible, as well as a few public toilets and pools. Stairs leading to the western bathhouse. 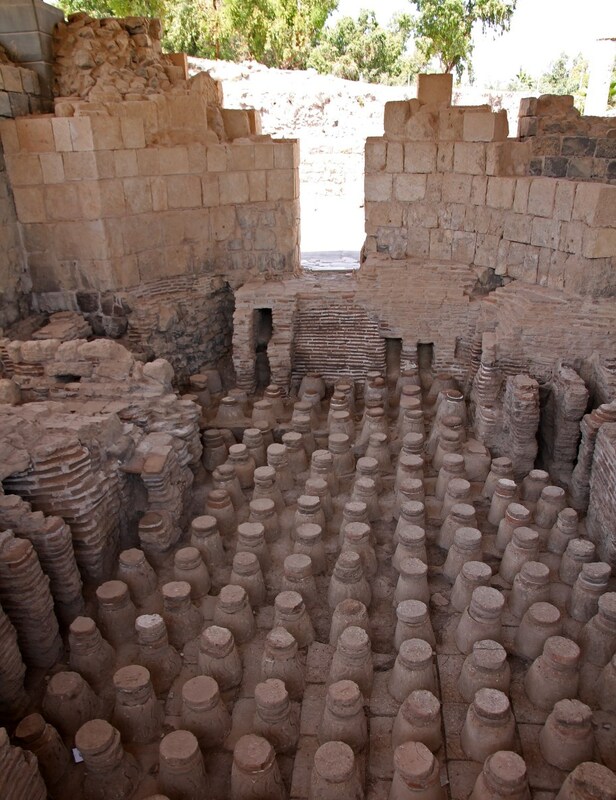 The hypocaust installation underneath the caldarium. 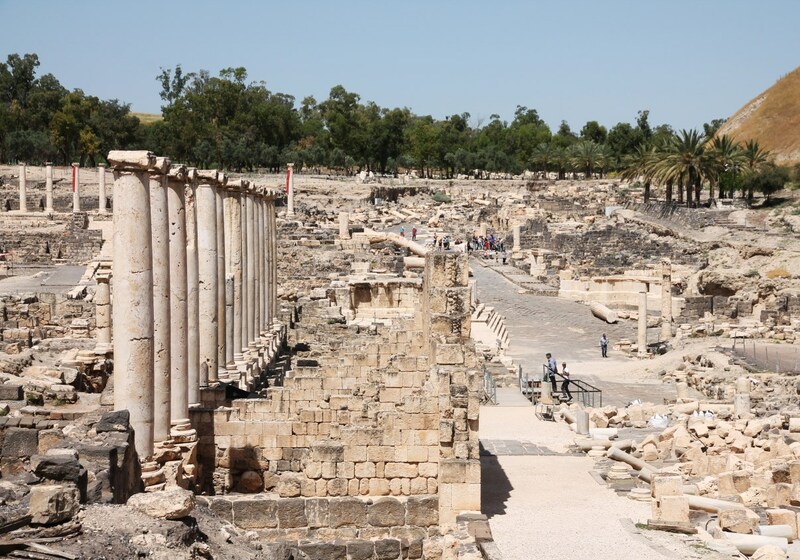 This 150-meter long street, flanked by two rows of marble pillars with Corinthian capitals, runs from the western bathhouse towards the intersection with Northern and Silvanus Street, at the base of Tel Beit-She’an. In Roman times, rows of small shops were standing alongside the road. It is fair to assume that this must have been the central commercial vein of this city. This semicircular row of rooms is located adjacent to Palladius Street, just north of the western bathhouse. 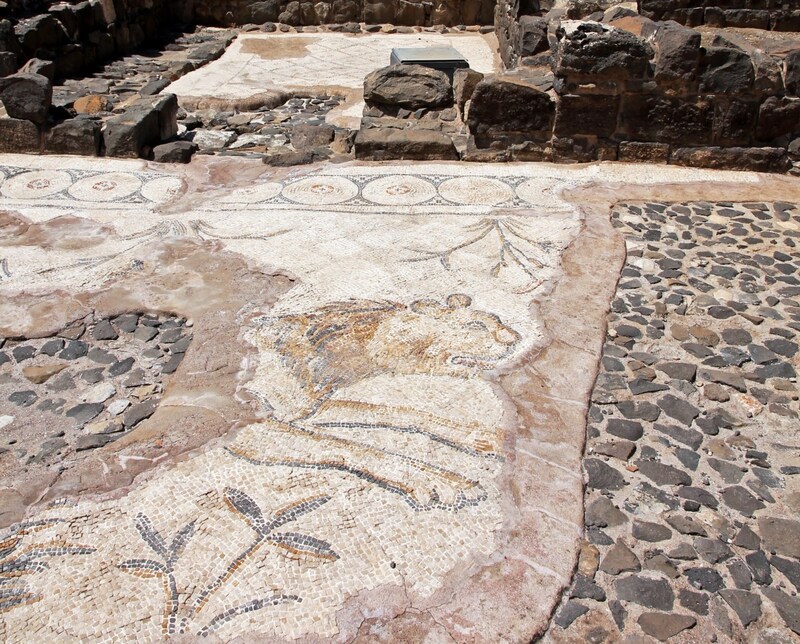 It is definitely worth having a look inside these rooms, since some of them are paved with beautiful mosaics, displaying Greek inscriptions, geometric motifs, plants and animals. The most famous mosaic, however, depicts the Greek goddess Tyche, the guardian deity who governed the fortune and prosperity of Scythopolis. 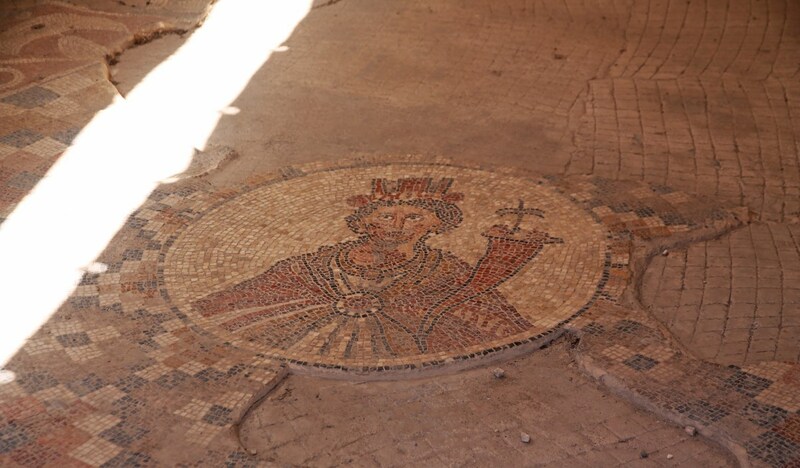 Mosaic depicting the goddess Tyche. 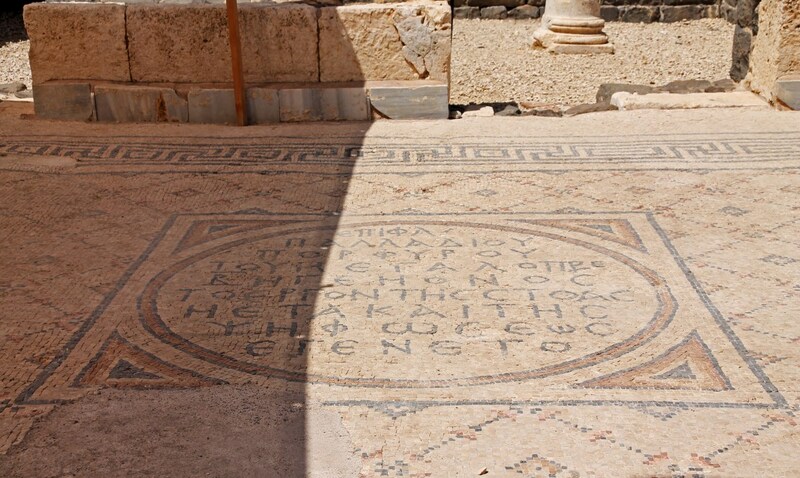 If Palladius Street is considered the central commercial vein of Beit She’an, then the agora was its commercial hart. 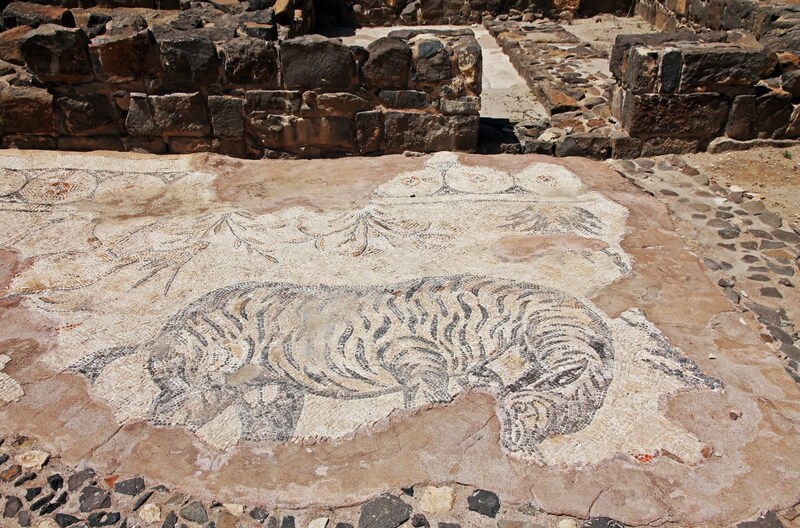 The western portico of this central market place is paved with mosaics depicting animals such as a lion and something that looks like a zebra. 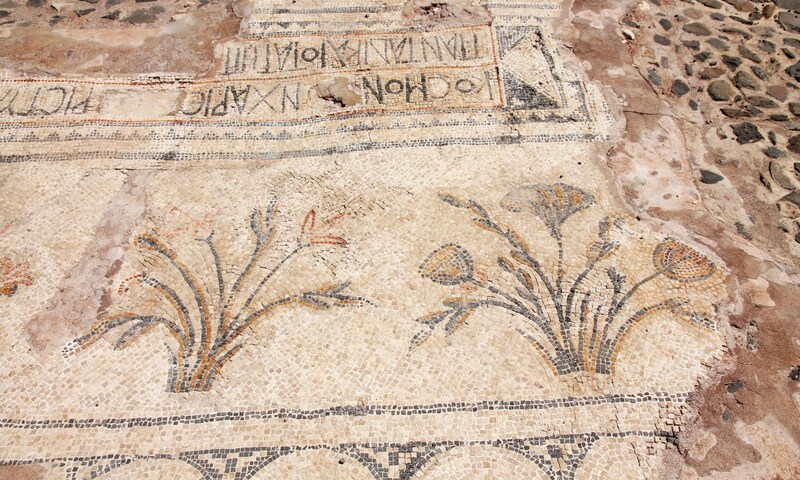 Mosaic depicting flowers + Greek inscriptions. Located on the junction between Palladius Street and Northern Street, this small, semicircular temple was originally supported by 4 columns. At present, there isn’t much left of this building, but most adornments can be found collapsed nearby. This public fountain dates back to the 2nd century CE. Several decorative elements belonging to this structure have been found in its vicinity, and there are plans to re-incorporate them in a future reconstruction of the nymphaeum. Left from centre: the semicircular nymphaeum. On the junction to the right: the Roman Temple (platform + 5 steps; note the fallen pillars). In our opinion, it is essential that you walk up the stairway to the top of the Tel (sadly, this is not accessible for strollers or wheelchairs), and for two reasons. Fist of all, this vantage point is the best spot for a panoramic view over the city, and a preferred place for selfies with the ruins. 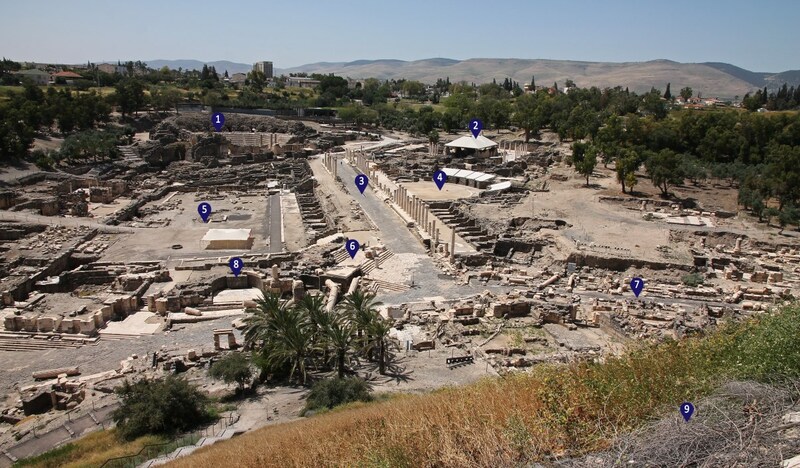 Secondly, the Tel is where the first settlements of Beit She’an were situated, starting from the Neolithic period (5th millennium BCE). If you walk around the top of the mound, you will come across many ruins, including a governor’s house from the time of Egyptian rule. Their are many information panels at the base of Tel Beit She’an. 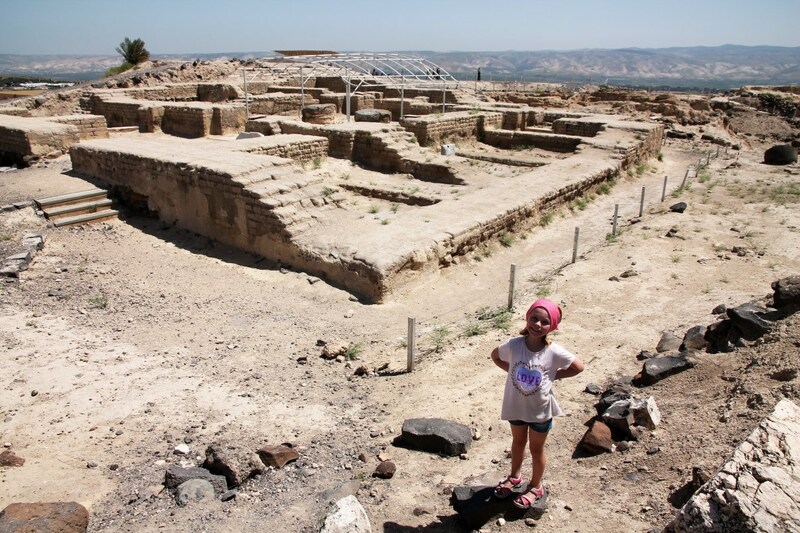 The Egyptian Governor’s house on Tel Beit She’an. 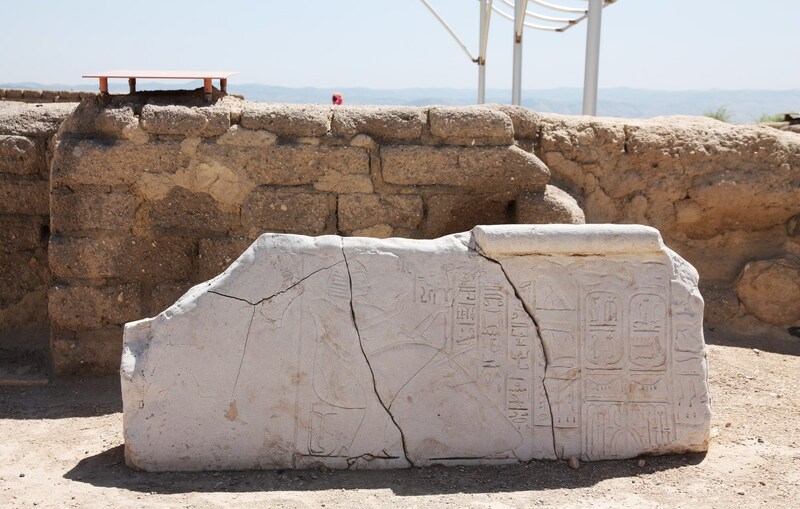 Reconstruction of Egyptian hieroglyphs found on Tel Beit She’an. 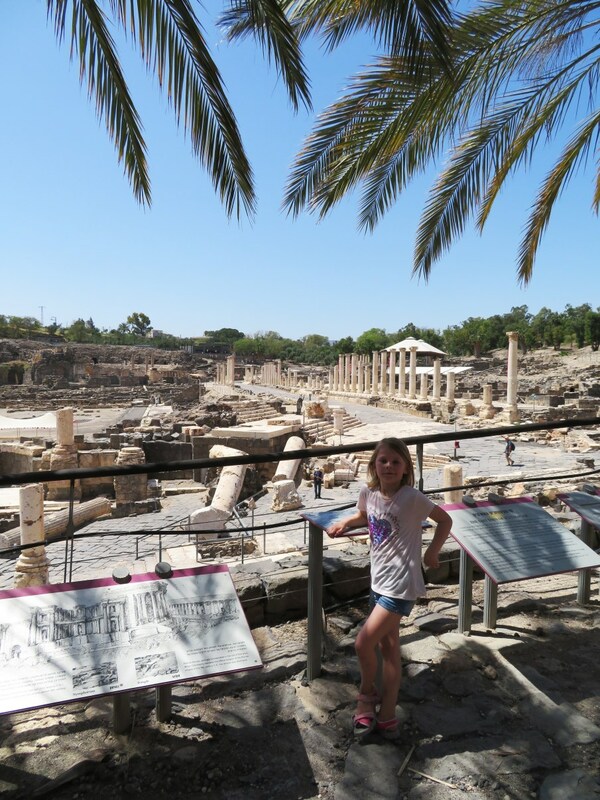 An interesting and beautiful stretch of Roman road, the view of Silvanus Street is dominated by a monumental colonnade and a marble-reveted pool built alongside it. The colonnade, with one arch of a more recent portico in front of it. The colonnade, as seen from its side. This smaller bathhouse contained a caldarium (room with a hot plunge bath), heated by a hypocaust, as well as a frigidarium (cold water bath hall). In front of the eastern bathhouse and the agora. This structure encloses a courtyard, decorated with columns. 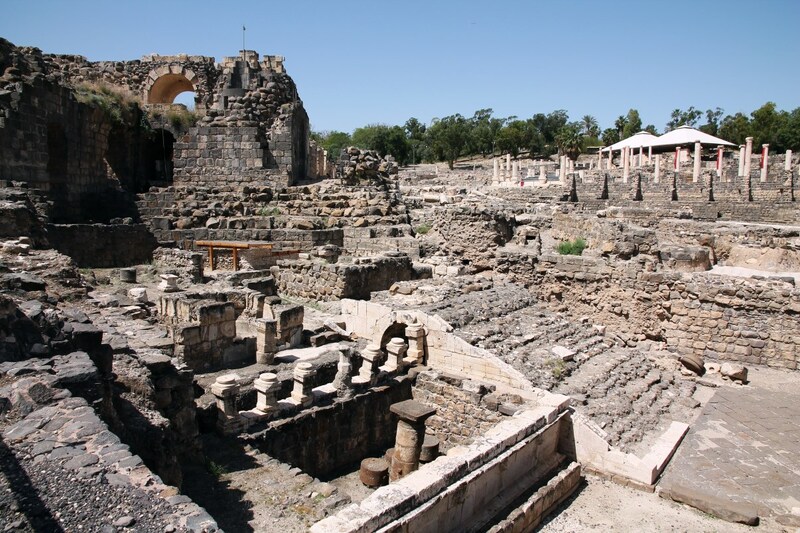 Built in the 1st and 2nd century CE, this compound included a temple, engraved altars and a nymphaeum. The temple was built on an elevated square, with a staircase leading up to it. In the front: the engraved altars. In the back: stairs leading to the elevated temple. Tired after your visit? In need of some recreation? Well, we just happen to know the perfect place to rest your legs and go for a relaxing swim! 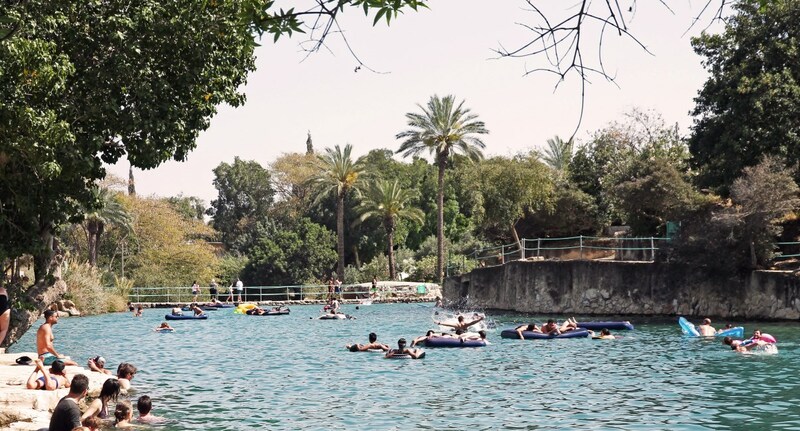 Gan HaShlosha National Park is situated only 6km (10 minutes driving) from Beit She’an. This green oasis benefits from naturally warm spring water for visitors to swim in all year round. 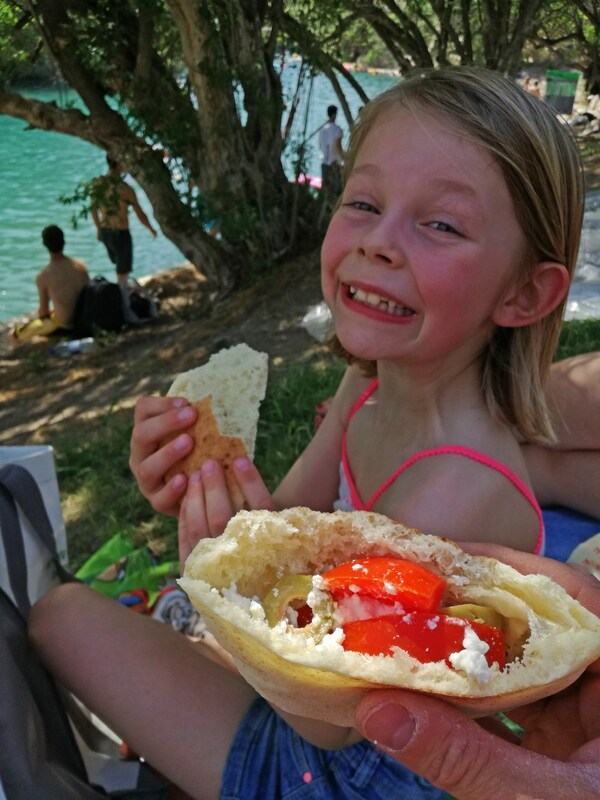 Even though it can become a bit crowded at times (it obviously is a very popular place for a picnic and for local families with children), it still has a very pleasant atmosphere. Come early and you can pick the best spot in the shade, take out your picnic basket and bathing suits, and just relax the rest of the day. But even if you come a bit later, don’t worry. We arrived here in the afternoon and could still find a relatively nice place where we had our lunch. Highly recommended! To honour the Roman deceased in Šempeter... and go for and afternoon swim in Laško. How to make the most of your visit to Rovinj (Croatia).